Here we will learn about the beautiful angels and our great Saints! © Faith of the Fathers, 2005-2018. All rights reserved. 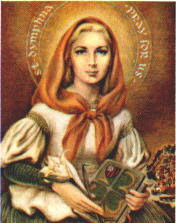 Saint Dymphna was born in the seventh century. Her father, Damon was a pagan and her mother was a very beautiful and devout Christian. When Dymphna was fourteen her mother died. Damon, her father, is said to have been afflicted with a mental illness, brought on by his grief. He sent messengers throughout his own and other lands to find some woman of noble birth, resembling his wife, who would be willing to marry him. When none could be found, his evil advisers told him to marry his own daughter. Dymphna, with the help of St. Ocrebran, her confessor and two other friends ran away. Her father found them in Belgium and he gave orders that the priest be executed. He tried to persuade Dymphna to return to Ireland with him. When she refused, he drew his sword and executed her. She was only fifteen years old. Dymphna was made a martyr in defense of her purity. She is the patron of those suffering from nervous and mental afflictions. Many miracles have taken place at her shrine, built on the spot where she was buried in Gheel, Belgium. Louise was born on August 15, 1591, in France. She had always wanted to be a religious but because of her poor health, many of the orders would not let her join. She married Antony Le Gras in 1611, an official to the queen. Her husband died thirteen years after their marriage, leaving Louise with a son. Saint Vincent de Paul was her confessor. He organized groups of men and women to help the poor and the sick in each parish, and from them, with the help of Louise started the Daughters of Charity dedicated to the bodily and spiritual service of the poor. Ten years later, the Sisters of Charity was approved by the Church. Louise took her vows in that order and served as its superior. Saint Vincent said that the chapel of the Sisters is the parish church, their cloister the streets of the city and the wards of the hospitals. Louise was a woman of great courage, and remarkable self-sacrifice in spite of her feeble health. She was most willing to humble herself in doing works of charity. 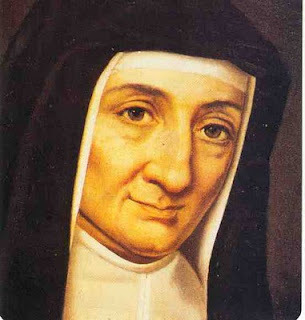 She was always motherly in dealing with the Sisters as well as the poor and the sick. In her last days she said to her grieving Sisters: "Be diligent in serving the poor. Love the poor, honor them, my children, as you would honor Christ Himself." She died on March 15, 1660. Mary Rose Julie Billiart was born in Belgium. She was the sixth of seven children. Her parents Jean-Frangois Billiart and Marie-Louise-Antoinette Debraine were peasant farmers. Her uncle, the village school teacher, taught her to read and write. While she was still a young woman, she was sitting beside her father when some one shot at him. The shock made her very ill and completely paralyzed. Although helpless, Julie offered her prayers so that sinners would find eternal happiness with God. She was closer to God than ever and kept on teaching catechism from bed. Julie was very holy and people came to her for advice because she helped them grow closer to Jesus and practice their faith with more love. She encouraged everyone who came to her to receive Holy Communion often. 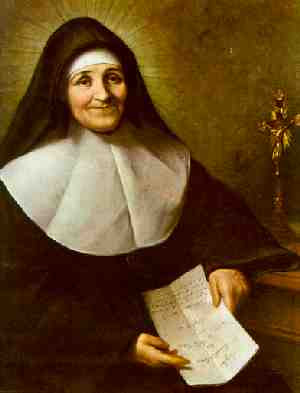 St. Julie spent the rest of her life looking after and training young women to become sisters. People who did not understand her mission, hurt her a lot, but she always trusted God. Her favorite words were: "How good is the good God." Mystic Monk Coffee - The BEST Coffee Online! Help support the Carmelite Monks of Wyoming!